A spanning tree of a graph is a subgraph that includes all of the vertices, but only enough edges to connect them. 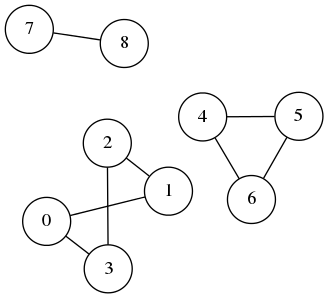 A connected graph will have more than one spanning tree unless the graph is a tree, in which case it has just one spanning tree which is the graph itself. A spanning tree of a graph of order \(v\) will contain \(v – 1\) edges. In order to list all of the spanning trees of a graph, we could just construct all of the subsets of the edges of size \(v – 1\), and then check if they form a spanning tree, but that wouldn’t be very efficient. A more efficient method is to use backtracking, which is what the algorithm presented here does. The first condition prevents duplicates because the edges are always listed in ascending order. The second one ensures that the tree doesn’t contain too many edges, because an edge is superfluous if both of its endpoints are in the same connected component. In order to check this condition, I used the connected components of a graph algorithm I described previously. The C code is below. The function spanning_trees() takes a graph in edge list representation, the number of edges and vertices, and a user callback that is called for every spanning tree found. A connected component of a graph is a maximal subgraph in which the vertices are all connected, and there are no connections between the subgraph and the rest of the graph. A connected graph has only one connected component, which is the graph itself, while unconnected graphs have more than one component. For example, the graph shown below has three components, (0, 1, 2, 3), (4, 5, 6), and (7, 8). The connected components of a graph can be found using either a depth-first search (DFS), or a breadth-first search (BFS). We start at an arbitrary vertex, and visit every vertex adjacent to it recursively, adding them to the first component. Once this search has finished, we have visited all of the vertices in the first connected component, so we choose another unvisited vertex (if any) and perform the same search starting from it, adding the vertices we find to the second component. This process continues until all vertices have been visited, at which point we know the number of connected components in the graph, and which vertices they contain. These are implementations of both connected components algorithms in C. An array is used to store the number of the connected component for each vertex, starting with component 0. The array elements are initialised to -1 so the array is also used to determine which vertices have not yet been visited, as their component number will still be -1.
const unsigned int neighbour = edges[i].first == vertex ? const unsigned int *neighbour = edges[e].first == *current ? The connected components of a graph can also be represented as sets of edges, rather than vertices. This is called the spanning forest of a graph.